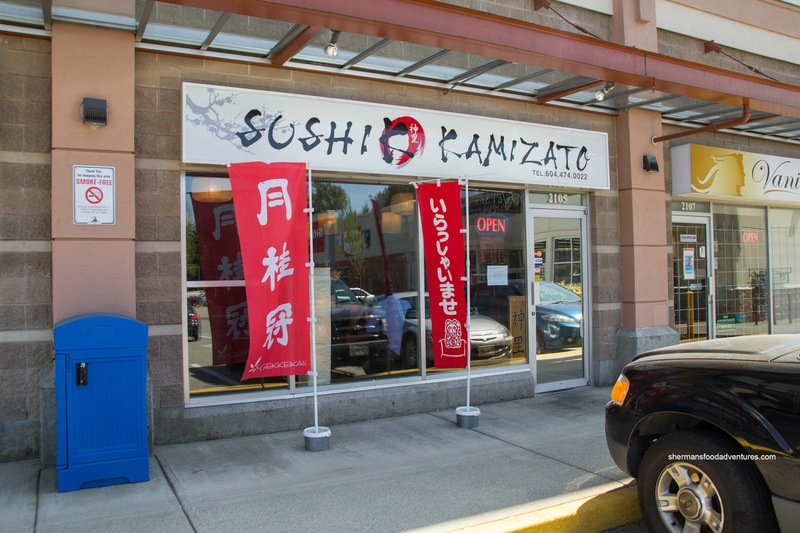 We are fully aware that authentic Japanese-run restaurants are a rarity in the GVRD. It gets even more scarce as we move further out into the 'burbs because there is a widely held belief that the clientele don't know any better. Now hold on there. Sure, there are still those who only do the California Roll thing, but just like with most things, people are figuring out there is more to Japanese food than a monster sushi roll with a thick layer of poorly-made sushi rice. That is why we find little gems such as Tokachi and Fuji Sushi. 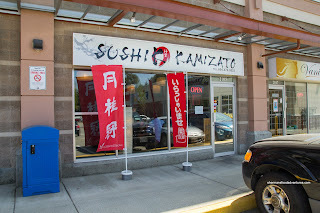 Now, add another one to this list in PoCo being Sushi K Kamizato (which is authentic with a modern twist). Joining me for this meal were fine Coquitlam residents Rich Guy and Rich Gal. We started with the Asian Nachos which was an interesting dish that seemed Izakaya-ish and indeed it was that. 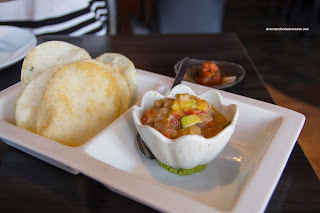 Arriving with crisps that resembled shrimp chips, there was a bowl of cubed tuna, avocado, tomato marinaded in a sesame oil dressing with house-made salsa on the side. We were only mildly enthusiastic about this dish because the tuna mix was far too watery. When placed on the chip, the moisture degraded the experience. Otherwise, the tuna was buttery soft and the salsa was bright with some spice. 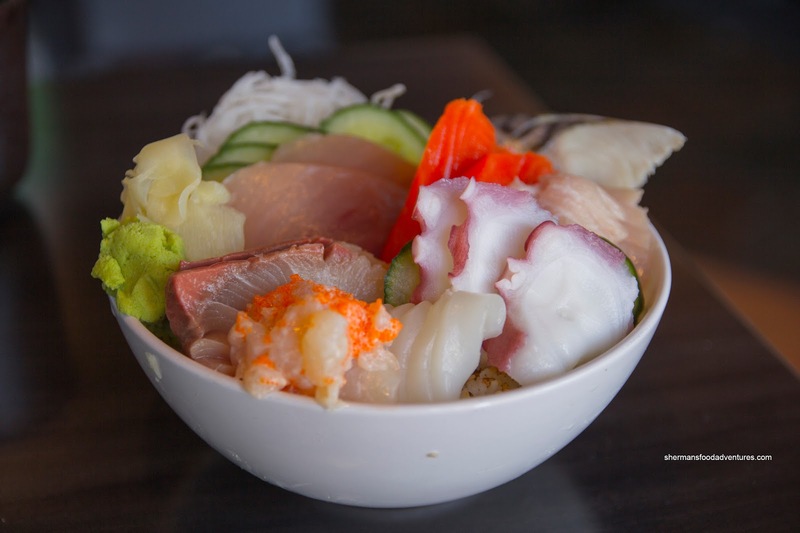 Continuing on with my recent fascination with Chirashi Don, we shared an order. This was well-prepared with aesthetically-pleasing sashimi which was equally good in texture and taste. The sushi rice was very good having a chewy quality that was not gummy nor slimy. It was also well-balanced in flavour too. We got 2 rolls for our meal with the Spicy & Shout arriving first. I think the chef happens to like the Beatles, hence the name (play on twist and shout). It consisted of spicy diced seafood with minced crab and ebi on top and tuna inside finished with sweet chips. Again, the good sushi rice was a good starting point for the roll. 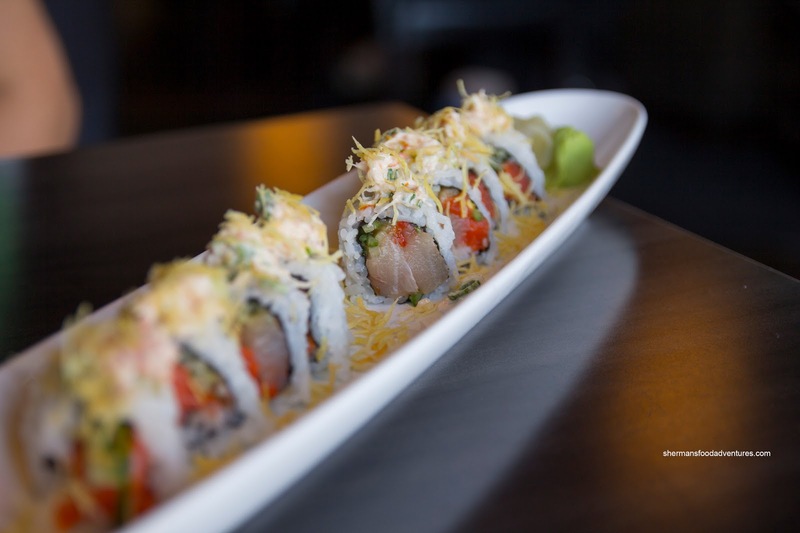 Despite its name, the roll was actually quite mild with some sweetness and a touch of spice. 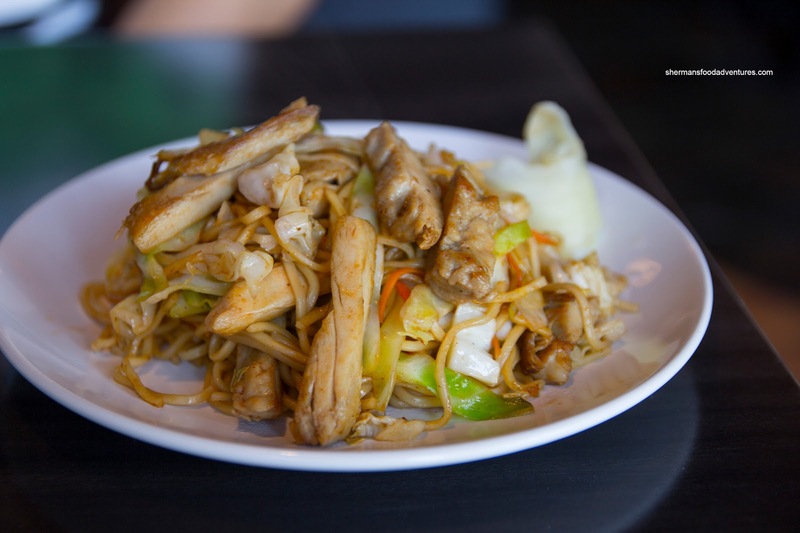 The least favourite item of our meal was the Chicken Yakisoba. Not only was it a miniscule portion for $8.95, the individual components were not that great. First, the chicken was very dry and stiff. Second, the noodles were also equally dry. Third, the whole dish was sorely lacking in flavour. Lastly, our second roll arrived almost 20 minutes after our first roll. I guess they were really backed up with the busy restaurant. 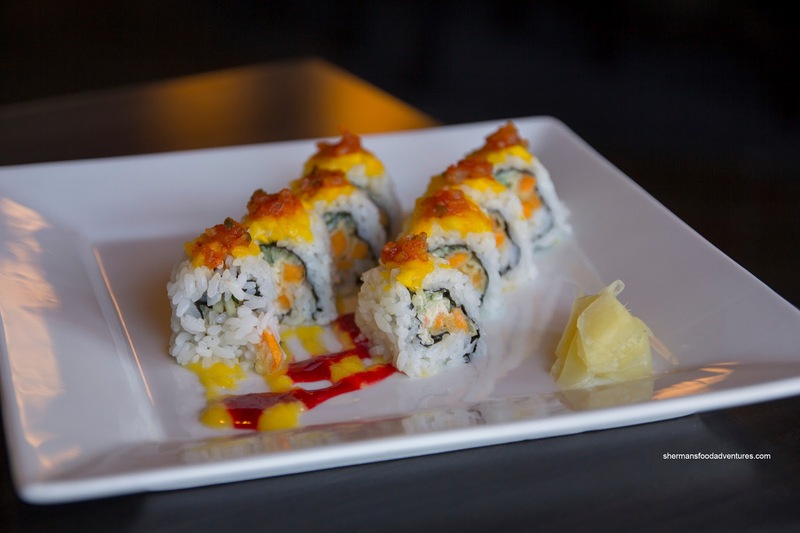 Interestingly named the Goodbye Yellow Brick Roll (and Elton John reference), it consisted of yam tempura with minced crab, ebi and mango salsa on top. It was finished off with a mango and raspberry coulis of sorts. We liked this roll the best as it had similar qualities as the first, but was accented nicely by the fruity coulis. At the end of our meal, we were pretty satisfied, if not only mildly impressed. Most of the food, especially the sushi and sashimi were well-prepared. I guess this is good and authentic for Port Coquitlam. I totally agree with your experience at this place! !